Gangrene in diabetes is very dangerous. It is a type of infection that can break out easily on the skin with the rise of blood sugars. Blood sugars that remain high for long periods of time, and are shown by your elevated A1C levels, carry a high risk of many of these complications. Infections is what makes for chronic wounds in a diabetic person. This is what causes the infection in the first place, and leads to amputations of the limb. Blood sugars that are steadily in the high range eventually lead to neuropathies. The neuropathy decreases a lot of the healthy circulation and causes a person to not feel any pain. These ailments will contribute to a small cut or blister. The blister or cut on the foot then becomes infected. This is why special attention to the feet is necessary every day, to try and prevent these problems. Just what is this serious skin infection? It is actually a tissue death and decay of body tissues caused by infection, lack of blood flowing properly, or else thrombosis. When the blood supply is very insufficient either caused by injury, contaminations with bacteria, or otherwise, is what brings on this critical infection to begin with. The best treatment for this serious skin infection is restoration of the affected organ. This will hopefully heal the effects of necrosis and permit the healing process. A lot of treatment depends on how deep the tissue damage is, and medically speaking, treatment may allow digits to fall off, (auto-amputate), or to amputate which is usually the last option. Wet gangrene is an infection that is caused by bacterial infections in the first place. Dry gangrene is an infection that is brought on by a serious lack of circulation in an injured limb or diseased area already formed. Another variation of this infection, is called diabetic foot that is often seen in diabetes that has not been controlled well. 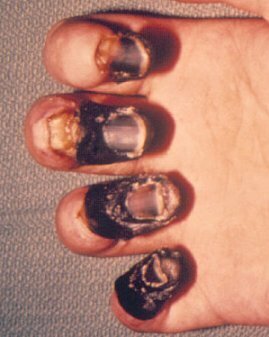 Unfortunately, infection grows rapidly in gangrene, and this is why so many amputations happen with diabetics. This is why tight glucose control is so necessary to avoid this problem. It is not uncommon for diabetic people to have skin which is very dry or itchy. Then as you scratch, open sores and abrasions that are caused from scratching become open to infections.